It is a shame if I don’t write about Puttu and Kadala. It is like bread and butter in Kerala. I have eaten it all throughout my life and can connect it with many stories, old sayings, humorous and real incidents that evoke laughter. In every Malayalee household morning revolved around making, eating and enjoying puttu in good old days. With changing times, it has been pushed aside due to the work involved but it is a beloved food even today. It is now simplified and considered a quick food when ready-to-use rice flour is used. 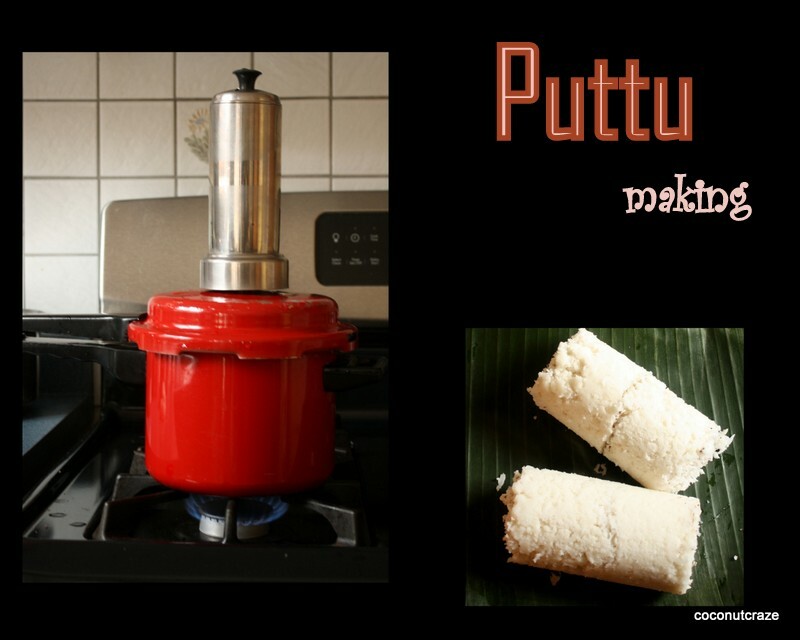 Puttu is rice flour filled in cylindrical tubes and cooked by steam. Grainy rice flour rather than fine powder is used in this preparation. In olden days, villagers used to pound moist rice in a huge stone grinder using a wooden pounder that has an iron tip. This rice flour is sieved, gently roasted and cooled. I have seen my grandma get the flour ready the previous evening to make breakfast the next morning. It was a pure labour of love! In the morning, rice flour is made moist by sprinkling salted water. It should be a moist mixture that cling together but not wet. There is a special utensil to prepare Puttu, called Puttu kutti. 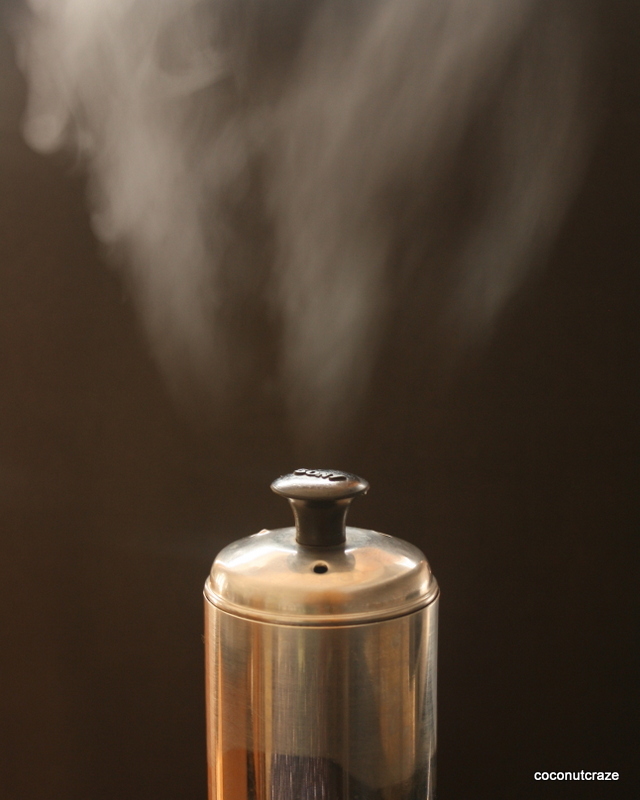 It has two parts, a bottom pot that boils water and produces steam. There is a detachable top cylinder. A small sieve is placed at the bottom of the cylinder letting steam pass through and cook the flour but stopping the flour from falling down. Some people use bamboo cylinders giving it an organic touch. 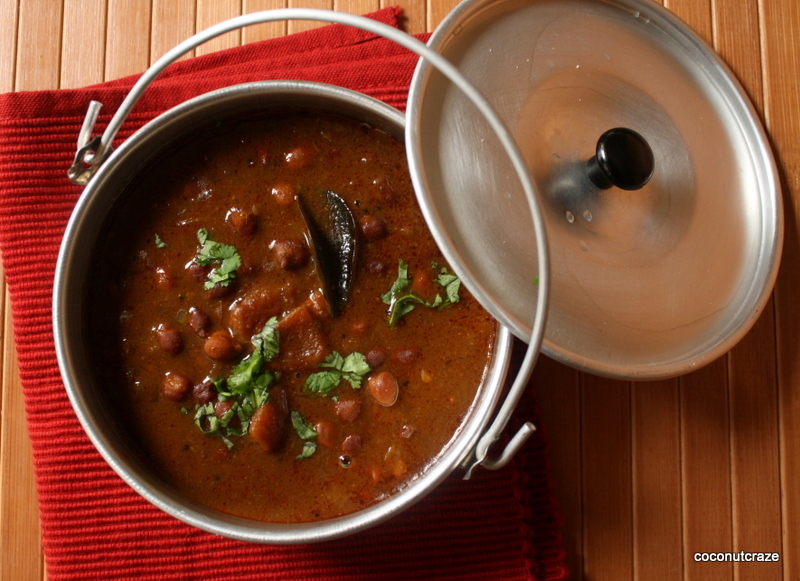 I use a pressure cooker to steam and insert the kutti on the top steam vent. Puttu is assembled for cooking by placing a bottom layer of coconut grating and a portion of rice flour filled loosely. Then there is coconut layer to separate, then flour and coconut on top. When closed with its lid the cylinder goes on top of the cooker with water boiling. It is to be steamed for 10-15 minuted on medium heat. I use raw rice flour to make Puttu. As we don’t sit down for breakfast often, I make this for dinner. Back home, when I mentioned it to a cousin, she considered it blasphemous! I call it convenience! 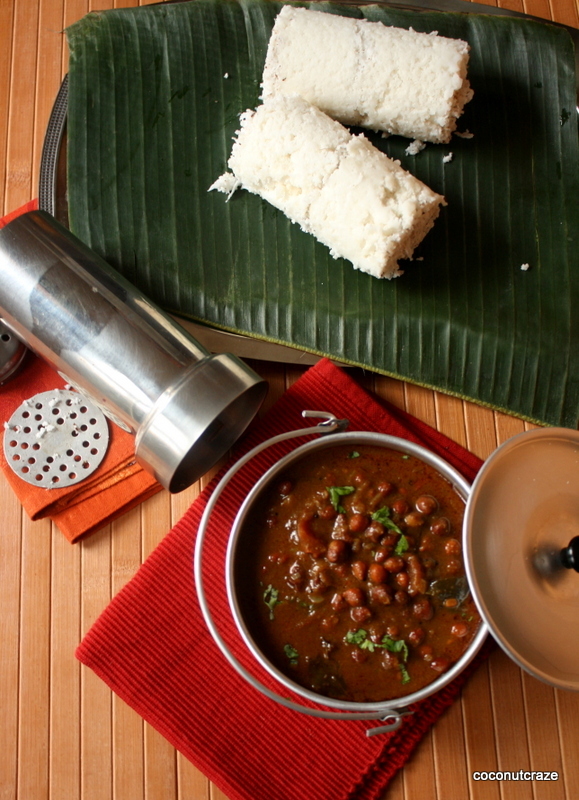 Puttu is normally accompanied by Kadala curry, a classic side dish. Kadala is dark brown Channa/Chick peas. This curry is made with a roasted coconut paste gravy. Take oil in a frying pan and add all the ingredients and fry until coconut browns. Grind it to a fine paste after it cools down. Heat coconut oil in a pan and add mustard seeds to splutter. Add curry leaves and red chillies. Fry chopped onions until it is golden brown. Add chopped tomato and fry till it is cooked. Pour the masala paste with little water and cook. Add cooked chick peas and some water from it. Boil this well until all flavours combine. Simmer for about ten minutes on reduced heat. Turn off heat and add chopped coriander leaves. This is a country style preparation. You can enhance it by adding ginger, garlic paste and pepper powder. My mother-in-law used to fry some onion till it browns and add a little cooked chick peas and grind it. This is added to thicken the gravy. Puttu and Kadala curry combination is a popular breakfast item in Kerala. You can find it served in most restaurants and food stalls in the morning. Green beans (mung beans) curry or just sugar and banana can also be paired with Puttu. Puttu can also be made using millet flour, wheat flour and tapioca flour. Sweet puttu can be made when jaggery is added with coconut. If you do not have a steamer that cannot stop you from enjoying this simple dish. Moist rice flour can be spread out on a clean cloth placed inside a steamer tray to make puttu. Sprinkle some grated coconut and allow steam to pass through the flour to cook it. Soft puttu will be read in 10-15 minutes. Pour curry over Puttu, mix well and dig in for enough energy to start a day! It is a wholesome, simple food that is easy to digest. 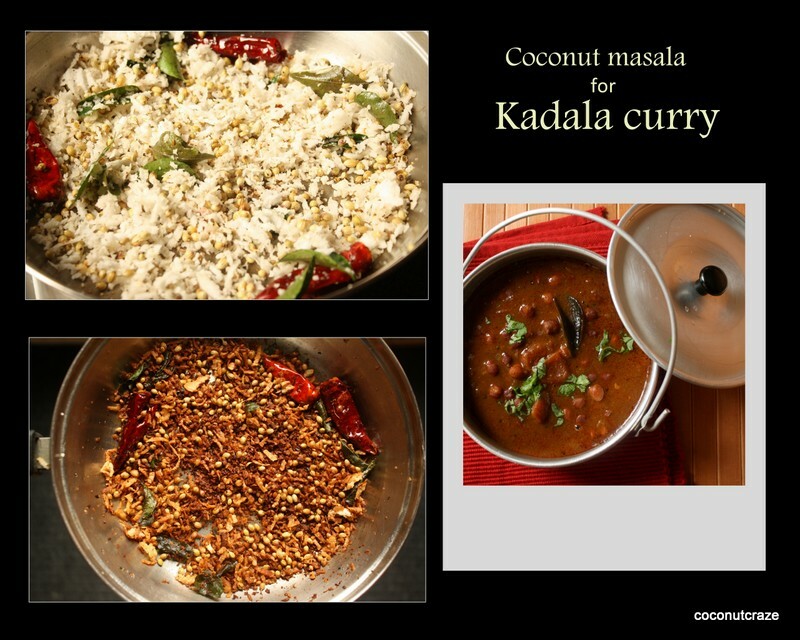 This entry was posted in Breakfast, Brunch, Coconut, Indian curry, Kerala recipe, Main dish, Side dish, steamed, Vegan, Vegetarian and tagged breakfast, chickpeas curry, fried coconut curry, Indian curry, kadala curry, Kerala chick peas curry, Kerala recipe, Nadan kadala curry, Puttu, Puttu kutti, rice cake, side dish for puttu, steamed rice cake. Bookmark the permalink. One authentic recipe combo from Kerala…I totally agree it is pure love with labor 🙂 Looks simply awesome!!! It is a regular food and most people enjoy it. Thank you, Malar! I appreciate your encouraging words! This is a traditional food much loved by a large population! As coconut is gaining more attention I thought this would be a very appropriate food that uses coconut in different ways. Thank you, Lili! Looks delicious! I used to have this in my friends place during my college days 🙂 Brings nice memories! Thank you very much. I have a friend who likes this and planning to give her a surprise soon! It is a staple in our home and make it once in a week at least. Thank you, skd! No worries, Vidya! Try the steamer method if you don’t have a putty. Make this curry with it and you will be delighted! The sweet versions have fillings like mashed plantains or brown sugar with coconut in between rice flour while steaming. Puttu can also be eaten with sugar and banana. This is one dish that has many possibilities, Padma! It can be cooked in any steamer. Spread a clean cloth inside the steamer tray and scatter a thin layer of moist rice flour and coconut. When cooked, it tastes the same but will not have a cylindrical shape. Hope that helps, Natalie! I liked the history, recipe and the way you have made it 🙂 It is one of my favourite dishes from Kerala. It is always a delight to eat puttu and kadala. It is more comforting and full of memories! Forget the puttu… i luv the clicks, especially the one which is whistling! Thank you, Mullai! It is so encouraging to hear from you! I am happy to know you liked the pics!